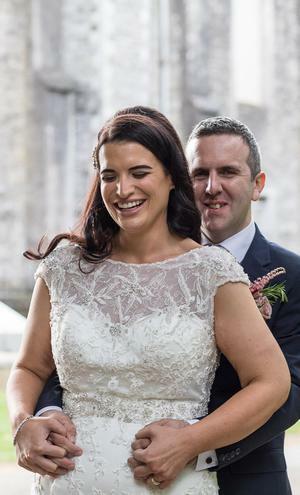 Rosemary from Slieverue in Kilkenny first met Tipperary man Walter on Tinder. "He swiped right first!" jokes Rosemary. Things took off from there for the pair and during a trip down the west coast of Ireland, Walter popped the question while they watched a romantic sunset from their room-with-a-view at the Armada Spanish Point in Co. Clare. While her initial reaction was"are you messing?! 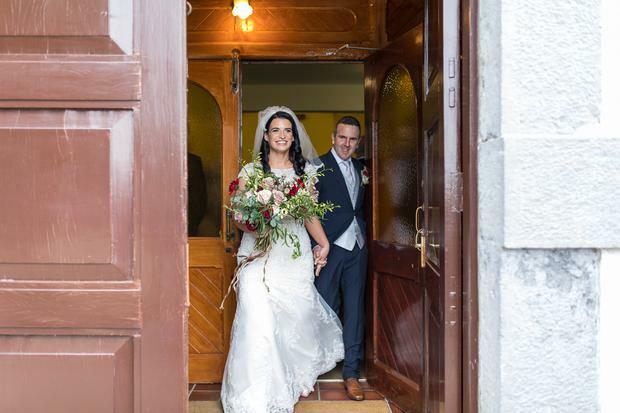 ", Rosemary of course said yes, and their pair tied the knot in her local church - the Church of The Assumption, Slieverue - in a ceremony celebrated by Fr. Thomas Corcoran. 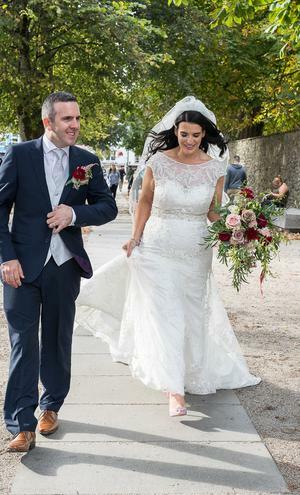 Later in the day the happy couple and their guests made their way to Newpark Hotel in Kilkenny for their reception. 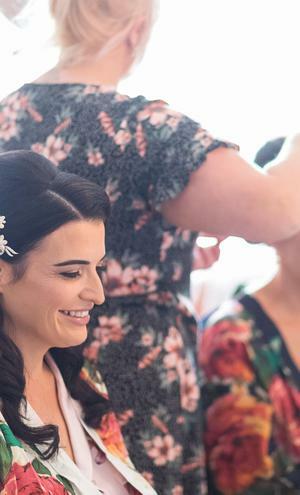 Having been involved in numerous weddings and special events during her years in hospitality and as a pastry chef with acclaimed luxury Irish cake makers The Cloudberrry Bakery, Rosemary knows what she likes and doesn't like, and for her bug day wanted to keep everything simple and elegant. 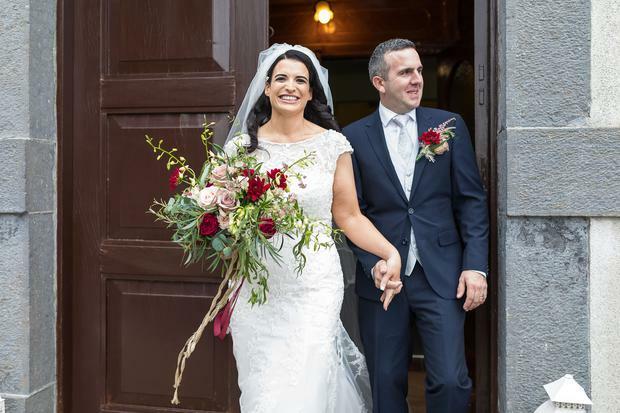 Her focus was on beautiful flowers - which set the tone and helped to create a theme for the day - and great food, - which Newpark Hotel ensured went down a treat by including 'firm family favourites' such as local mount Leinster beef and a classic fruit tartlet for dessert. 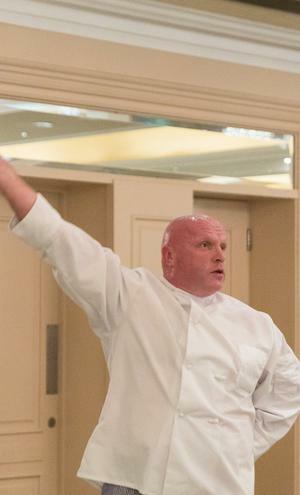 Before they sat down to eat however, guests were treated to some surprise entertainment in the form of Brendan McCarthy, aka 'The Singing Chef', who made sure the ice was well and truly broken at each of the tables! 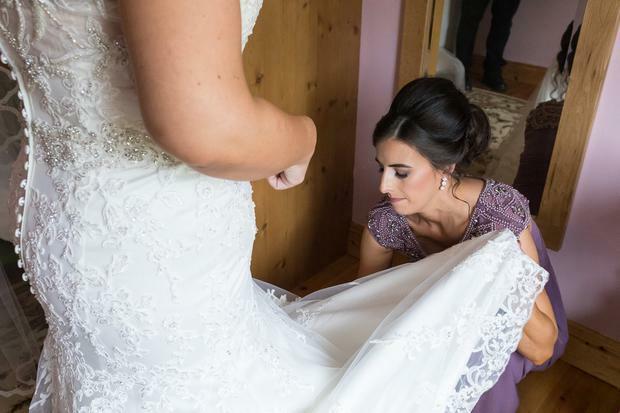 Their photographer was Katie Kavanagh, of Katie Kav Photography. 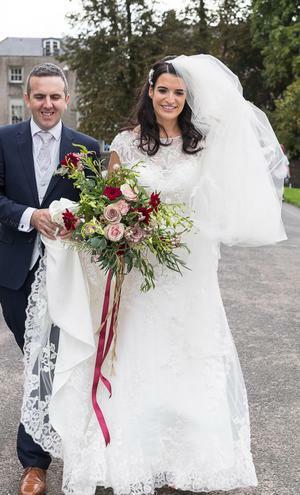 Rosemary found her stunning embellished lace fit and flare gown from Ruben bridal in Calverstown, Co. Kildare. "My sister spotted it the minute we walked in!" she says. 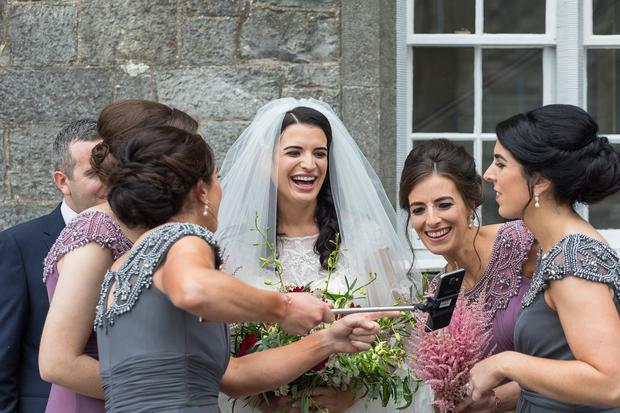 The bridesmaids wore matching floor-length gowns in two different shades from Folkster in Kilkenny, while the groomsmen went with classic navy suits, grey waistcoats and mauve coloured ties from Top Hat Suts, also base in Kilkenny. 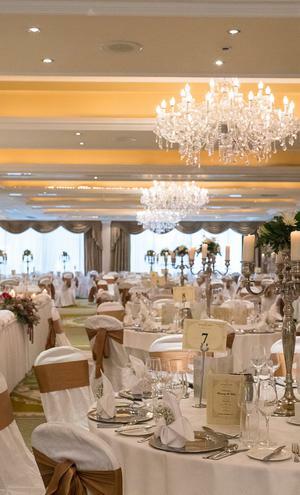 The couple held the reception in Newpark Hotel in Kilkenny. The choice was a no brainer for Rosemary, who knew she could depend on the staff there to take care of everyone. 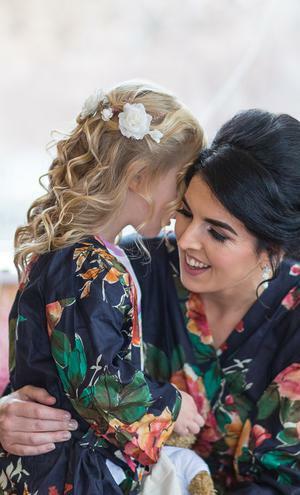 "I know the head chef and a lot of the other staff there through the industry," she says, "I just knew that we’d have no worries about anything if we booked there and I was proven right. From day one they just couldn’t do enough for us - we really can’t speak highly enough of the whole team there. They are an amazing bunch." For the food, the couple were keen to keep things simple. 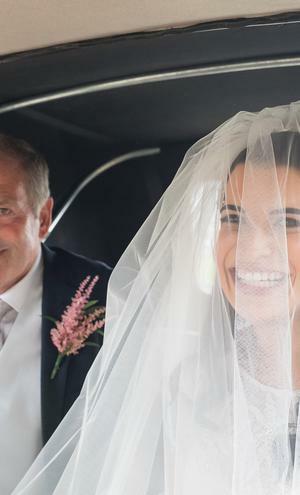 "We had lovely local mount Leinster beef and I was thrilled when I saw we could have a classic fruit tartlet for our dessert," says the bride. 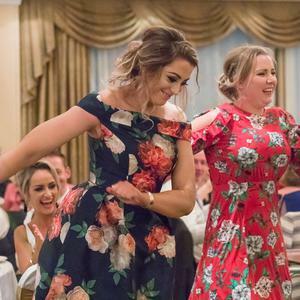 They served evening food along and included Tayto crisps and chomp bars - "they went down a treat when the lights came on!" 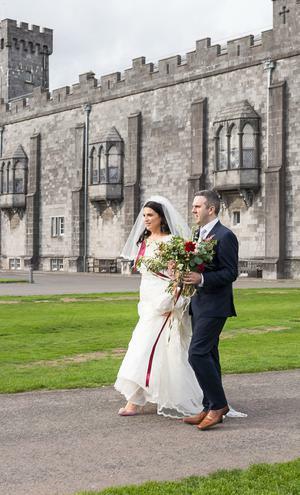 A couple of particularly perfect moments from the day do stand out for the couple: "The time we spent together at Kilkenny Castle for our pictures when it was just the two of us," Rosemary recounts as one of her favourite parts of the day. "I also loved the whole build-up on the morning." "Really try to take a step back and remember the bigger picture about things and what really matters," says Rosemary. "Don’t get caught up in details that really don’t matter. 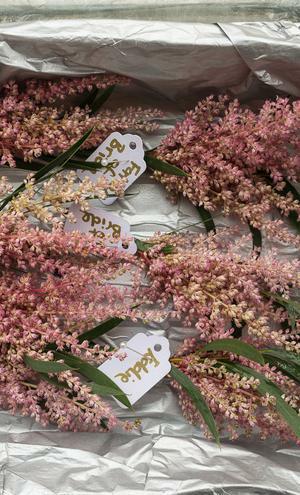 Also trust your suppliers, spend time choosing them and let them do their thing on the day as you’ve so many other things going on it’s good to be able to let go." 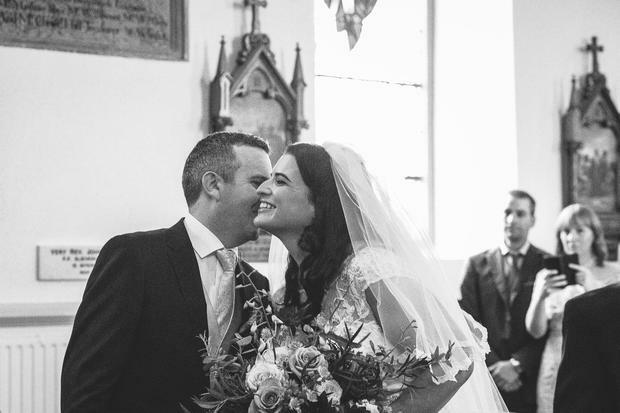 "All our suppliers were just amazing and gave us such good advice and took us by the hand every step of the way. I miss them a bit now!" 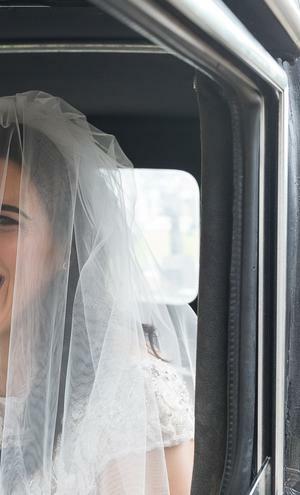 For their honeymoon, the couple went on a Mediterranean cruise where they stopped off in Rome, Sicily, Mykonos, Santorini, Athens, Naples and Sorrento. Karen Birney Brittany Hutson, an actor from California, first met Dublin-born software developer Karl Hutson at a job interview. 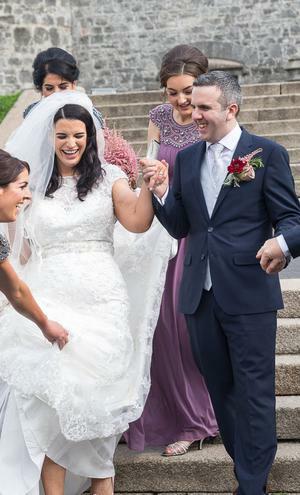 Karen Birney Martin McCarthy, a software developer, doctor Aisling McCarthy, both from Dublin, first met at a house party when they were in sixth year in school.